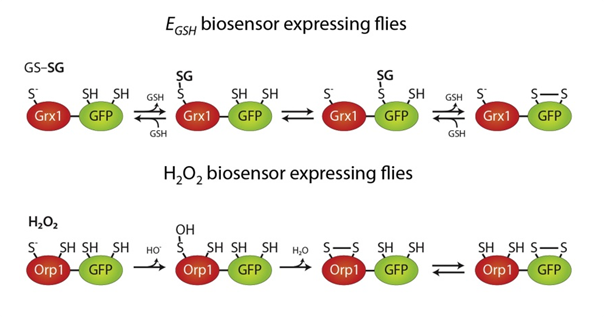 Redox-sensitive GFP (roGFP) fluoresces with different intensities depending on the local redox conditions in the cell. It can be fused to glutaredoxin (Grx1/GLRX) to monitor glutathione redox potentials or it can be fused to oxidant receptor peroxidase (Orp1/HYR1) to monitor hydrogen peroxide levels. Moreover, these fusion proteins can be localized to the cytoplasm or mitochondria to sense redox conditions in different cellular compartments. These methods were described in Albrecht et al. (2011). In Vivo Mapping of Hydrogen Peroxide and Oxidized Glutathione Reveals Chemical and Regional Specificity of Redox Homeostasis.